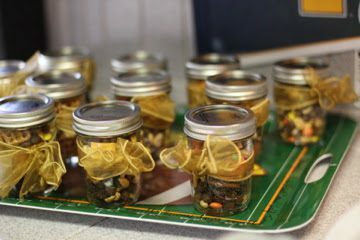 Mix together: cheese crackers, salted peanuts, and pretzel squares. 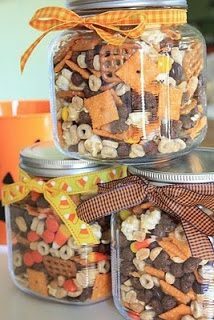 Then the sweet stuff gets added: Reese’s candy bits,caramel corn,honey nut cheerios,cocoa puffs, candy corn, and mallowcreme pumpkins.Either serve in a big bowl with a ladle or divide into bags or boxes or little jars for the tailgate. Be sure and wrap with the team colors’ ribbons!